The following is a reproduction of a conversation between Hasan and me. 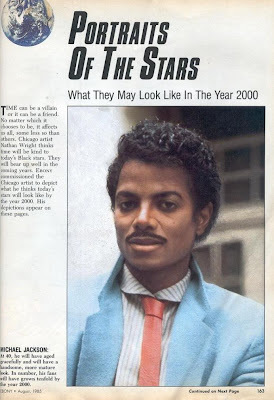 It began with him sending me a link to the following image, which is purported to be scan from an 1985 issue of Ebony magazine that envisioned what the stars of the era might look like in the year 2000.
me: hey, did you know that sanam once thought that cch pounder’s name wasn’t supposed to be pronounced with just the letters? hasan: so how did she pronounce it? Hysterical! Nell Carter?! I LOVE Nell Carter! I've always wanted to name a cat CCH Pounder. I love how he's wearing one of those suits that in the '80s they thought we'd be wearing in the future - "Max Headroom" fashion, if you like. As opposed the actual tatty same-ole crap we ended up with. Good mock-up, though. (Look, Ma, no CGI). Justin: Like Nell Carter? Google around for urban legends associated with her. See if your opinion changes. Marcus: Funny, I've always wanted to name a cat S. Epatha Merkerson. Mike: There are few greater pleasures than looking at how people in previous decades thought we'd look today. Or yesterday, for that matter. Mother, May I Pet the Pangolin?